I’ve posted these test results in dribs and drabs on Frit-Happens and Craft Pimp: time to consolidate! 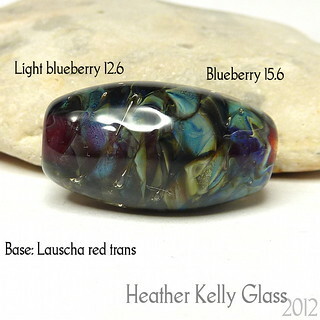 Lauscha blueberry is a new version of supernova that has more silver and is bluer in the rod. They sent me samples from several batches to test. These are all from the 14.6 batch. 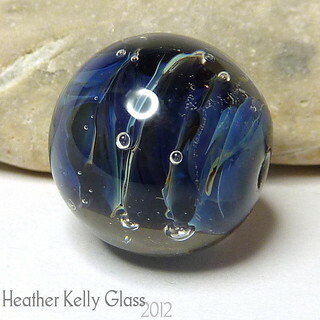 They sent me a couple of pics from a glassblower – he got a fairly silvery sheen to the surface that I haven’t managed to get in beads yet. 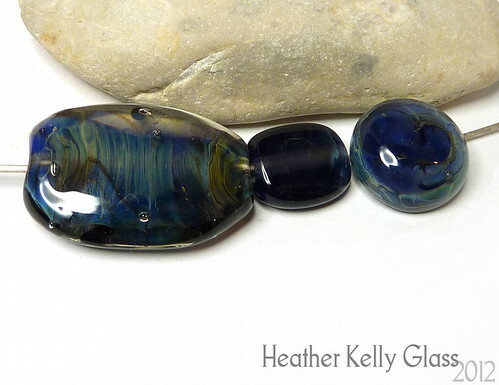 Not a solid mirror surface, but a transparent silver over the blue. 1. Small round, formed in neutral flame and reduced at the end. I got a little wisp of blue around the beadhole nearest to us, but that was all. (For reference, supernova doesn’t really do anything when reduced on its own. Sometimes it goes brownish). 3. 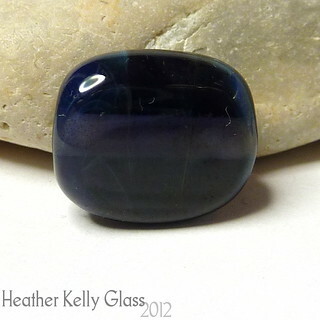 White base, then encased in blueberry supernova in a reducing flame. Reduced more at the end: some bits of interesting colour, some sooty streaks. 4. 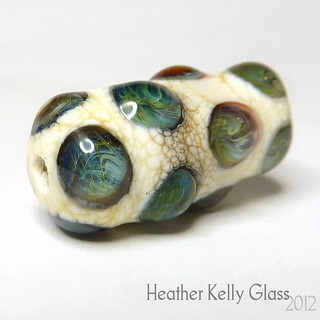 Long bead. the base is faded rose, striking red and Vetro lapis. I wound a spiral on in a reducing flame and melted in. 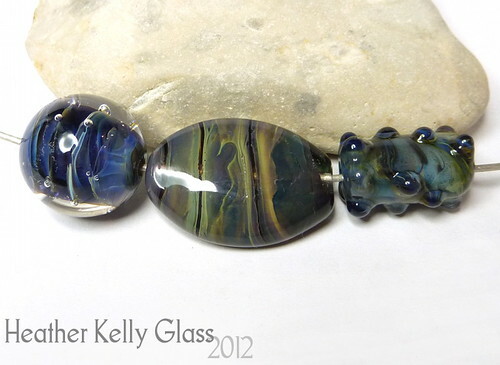 Got blues and greens (and the lapis went purple in the reduction). 1. This one’s a mess, really. 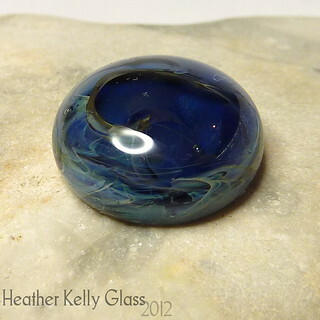 Base is blueberry supernova, melted in reducing flame. 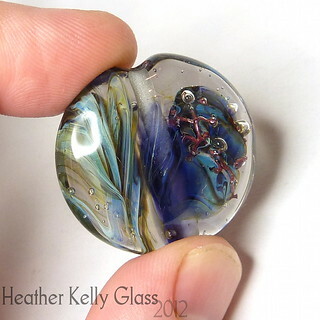 I wrapped a loose spiral of clear around and melted that in. I added the little dots in a neutral flame and reduced them afterwards, but I don’t think that reduction did anything as the end of the rod was already stormy from being used before. 2. 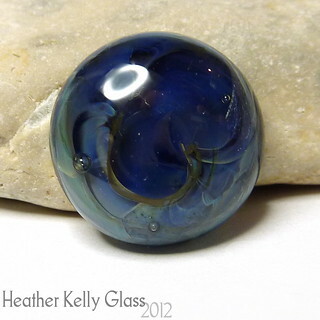 Clear base, spiral of blueberry supernova in reducing flame, melted in, pressed. I then reduced it a bit more and did some heating and cooling in a neutral flame. It *looked* a bit like it was striking somewhat – it seemed greener to start with. I’ve got various shades of smoke here and subdued tones. Definitely interesting, but quite dark. 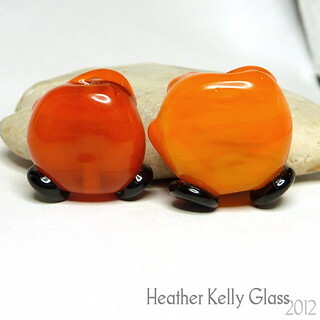 The glass is supposed to be able to go bronzey shades, which is kinda sorta what this is going towards. 3. I used a neutral flame for this one and wrapped on the already-reduced end of the rod. Then a spiral of SNT 100 clear followed by a full encasing. Best result by far! The interior colours didn’t vanish with a lot of heat when I was encasing, either. 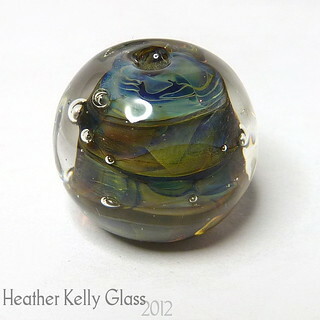 Thoughts: It is a bit like an auto-storming glass. 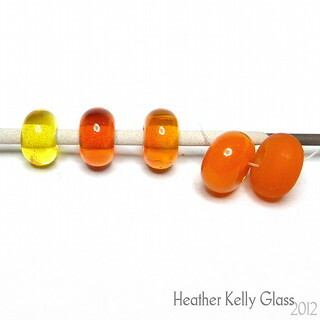 If you get the end of the rod molten in a reducing flame and let it cool a bit, you can then use a neutral flame to put it on a bead as normal and it’ll have the little wisps inside it. It is definitely easier to get something to happen than supernova was. This is 14.6 properly stormed over various colours of base dot. Stormed 14.6 blueberry supernova over (R to L): directly on ivory, light red, triton, itself. 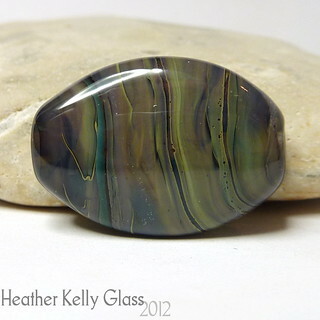 Stormed it is much the same as supernova – looks best over darker colours. Even the red is a bit light for the best effect here. 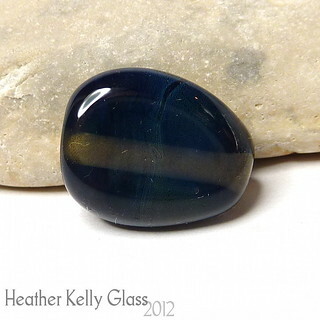 This one’s called light blueberry since it is lighter in the rod. 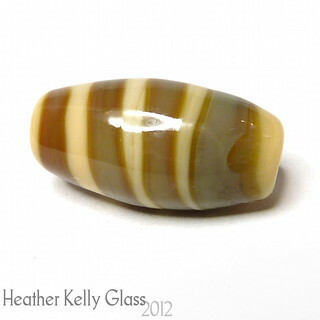 First, plain bead, made in neutral flame, pressed and reduced. 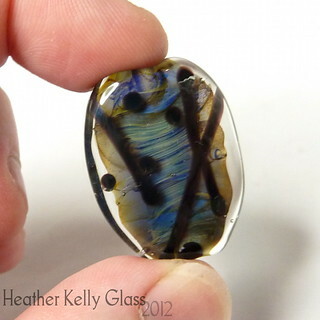 I tried making the bead and then reducing it, including trying a dragon’s breath flame: very little joy. There’s a tiny bit of blue barely visible round the centre but that’s all. 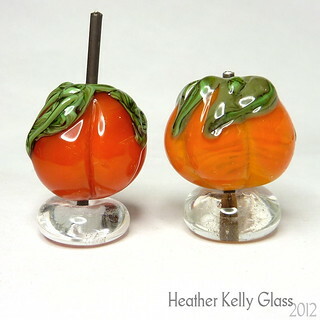 This one was melted in a reducing flame and encased. Some blue at the ends, but the middle has mostly gone an odd yellowy brown. I suspect too much reduction. Base of caramello with a spiral of light blueberry: I applied the spiral in a neutral flame, melted it in with a reducing one and tried letting it cool and waving repeatedly through a slight reducing flame. It did appear as if the colour was altering during this, though it’s hard to tell from what. 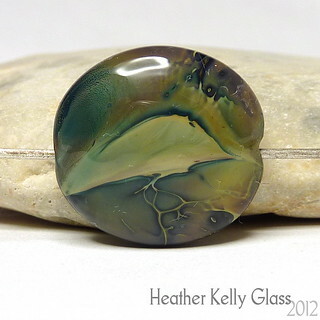 You can see there’s a light blue-green surface haze here – caramello isn’t the best base to show it up on. All together, then one at a time. Tried dragon’s breath reduction: very little going on. This one’s a bit more interesting. I started with a paddle on the end of the rod, then in a reducing flame I melted, twisted and squished it. Then used a neutral flame to make the base, encased it and pressed it. 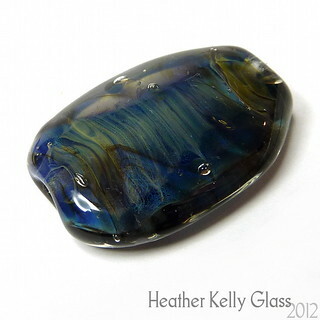 You can see wispy lines in the centre, but it also has the iridescent blue ‘envelope’ surrounding that. You can ignore the lines: I was also testing Lauscha’s deep silver black which spreads rather a lot. This is a popper-sized cab. Melted in a reducing flame, switched to a neutral one and then encased. A bit too much reduction. 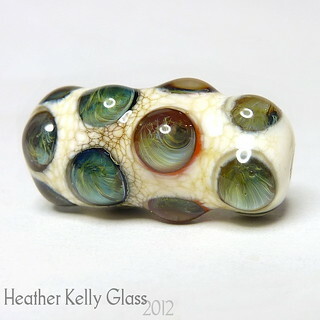 I made this bead in a neutral flame, then gravity swirled it in a reducing flame. I like the part where it has broken up into lightnings. Fun stormy sky effect in all. 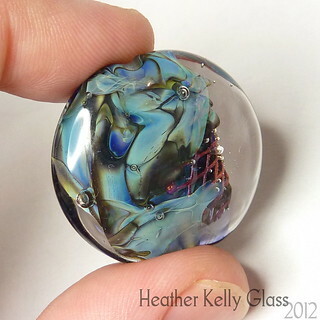 This is a base of Lauscha transparent red, spiral encased half in light blueberry and half in 15.6 blueberry. I razor cut spirals in the other direction and encased. The light blueberry hasn’t reduced to such an opaque effect as the other, so you can still see some of the red through it. Got a lot of brown on both halves though. 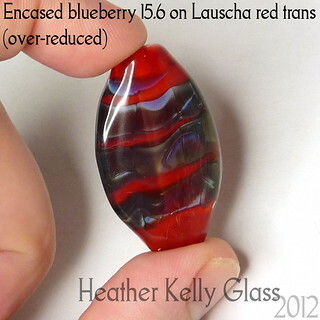 Lauscha transparent red, spiral of 15.6, melted in with redcuing flame (too much! ), encased, pressed and capped with more red. Mostly a disaster, with a hint here and there of what it could look like. Given that I seem to have to get it molten for any reduction to stick, it’s tricky to control how much you end up with. I got a better hang of it here, though! 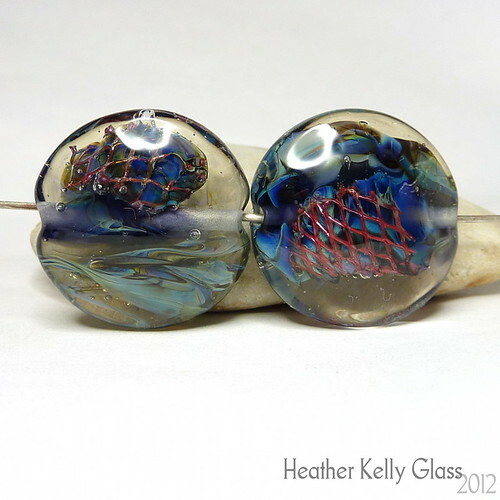 Both beads consist only of 15.6, copper mesh and clear. (I’ve been using Lauscha SNT 100 for all these, btw). For both of these, I started by making a decent sized gather of the 15.6, then heating the surface in a reduction flame so you could see things happening on the surface, then letting it drip onto the copper mesh. I encased the whole blob with clear, draped it onto the mandrel and in the first one I added more 15.6 to the side without the mesh until it was roughly the same all the way round and encased it, pressed and filled out the lentil shape with clear. 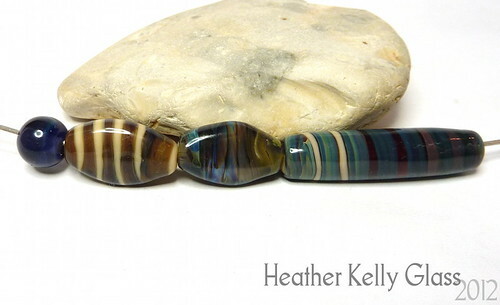 In the second bead, I made the spirally fronds in a way that Astrid Riedel showed us. I rather like how they came out. 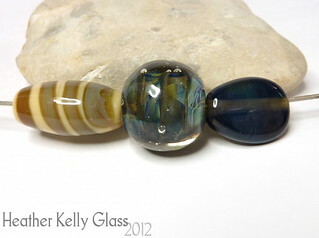 I managed to reduce these less, despite still doing it hot and melting the glass, so I have more blues and less brown.